Nice medium size 2 1/4 inch numerals for time and 1 3/8 inch characters for calendar. Easy to read without having to convert numbers to day and month. Black case fits any home or office decor. Preprogrammed and easy to set. Bright red LED's are as easy to read in bright sunlight as in darkness. 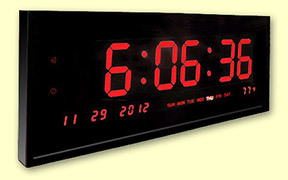 This calendar clock keeps you on track, without converting numbers to dates! Very convenient for the visually challenged and for those with difficulty converting dates to numbers. 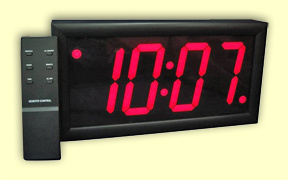 Dimensions: 15 3/4" W x 7 1/2" H x 1.5/8" D Time display: 2 1/4" H Calendar display: 1 3.8" H Leap year compatible ; Has AM / PM indicator lights. Long life battery saves settings in case of power outage. AC adapter & back up battery (included). $119.00 - GROUND SHIPPING INCLUDED when ordering on line! 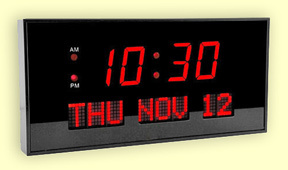 Day, Date and Month Calendar display. Dimensions: 20" x 7.5" x 2" – Weight: 3 lb. $129.00 - GROUND SHIPPING INCLUDED when ordering on line!